Before we get into the details of the track and the ride, maybe a bit about the gear first? For this ride given the temperature range I pretty much took the same gear that I took on the ill-fated Cloudride expedition earlier this year... well at least for most of it. But I did change a couple of key things. Firstly, lights / charging system. The Supernova system that I've been using for a new years now is gone and replaced with an Exposure Lights Revo Mk 1 and a Sinewave Reactor USB charger. This setup proved to be amazing - pretty much ideal for this sort of riding in that it was set and forget - the balance between the two seemed ideal and I could just leave the light on and GPS on charge pretty much all the time - I think the lowest charge % my GPS hit was 95%! I also swapped pedals to the new Speedplay Syzr which was a bit risky but they proved to be trouble free over the 1000km although I did notice that too much mud did affect the ability to clip in though. Apart from that is was all pretty much tried and true gear with not a lot of surprises. Perth and Singapore are in the same timezone so my after work flight on Tuesday arrived at about 1am on Wednesday morning. I had a hotel in Perth so it was a very early morning putting the bike together - sadly the bead on my tubeless tyres had broken but at least I was able to prove that I can seat a tubeless tyre with a hand pump... oww. I was up at 6:30 and at the brekky buffet by about 7 dressed in my riding gear - I hadn't packed 'normal' clothes as part of my kit so it was going to be a long week in lycra! Of course I'd only had about 3 hours sleep at this point. I'd chosen to take a bus from Perth to my start point in Albany - this was a pretty easy option with a 6hr bus ride that arrived in Albany at around 3:30pm. Of course this meant a 8:30 am departure and a little ride from the hotel to the bus (train) station. I was actually thinking for a while that the plan could be to just arrive in Albany and start pretty much straight away - after all (my thinking went) in an ITT, day/night is irrelevant so may as well just get going right? Fortunately I had some time on the bus to think and realised that after a stressful week or two at work and no sleep the night before an early night and early start might be the more sensible option! I had chosen to start in Albany as the way the track worked (at least on paper) was that the easier (flatter) sections were in the south with the northern sections being more technically challenging. My thinking was that it was better to start easy and ride myself in rather than get hit with technical hills at the start of the ride. To my mind, having completed the ride, going North is definitely the way to go - getting progressively more difficult forces your mind to engage with the trail whereas if you got easier then its easy to switch off and get bored. I started day 1 at 7:25am Thursday and had a rough target of hitting around 200km per day but was pretty much following my TDR strategy of planning not to plan - i.e. if I felt good, keep going and if I was struggling then stop. Based on the route notes it looked like there was going to be somewhere for water every 50km or so but there were going to be at least a couple of sections of 120km with no food resupply but all in all pretty manageable and besides, surely there was going to be something in between that wasn't on the map right? The first stretch from Albany to Denmark certainly fulfilled the promise of a flat track with occasional singletrack sections cut in to relieve the long gravel roads. But the smooth roads and flat track didn't last and the true nature of the Munda Biddi began to reveal itself. On average the course was flat. On average. I don't think there was any section in the remaining 925km where I wasn't either on (at least) a slight climb or descent - most of it ridable but it still takes it out of the legs. The rough idea was to get to the camp at 170km and take it easy for the first day with a stretch goal to make Walpole (210km) by late evening and then call it. To my surprise I managed to get to Walpole just after 8. Of course then the realisation hits that this is small town Australia and by 8pm on a week night nothing is open! After riding up and down the main street a couple of times I saw a motel that had a restaurant that still had a couple of people inside. Sadly it was closed but by shivering a bit and looking generally bedraggled the owner was convinced to stop the cook from leaving and get me a meal and I ended up sharing a nice hour in the bar with a couple of randoms (one walking the Bibbulmum track and the other just stopping over driving through). I almost decided to get a room and stay the night but in the end decided what the hey and got my cold riding gear off and headed out into the night to see if I could make the campsite at 250km. In hindsight I should have stopped. 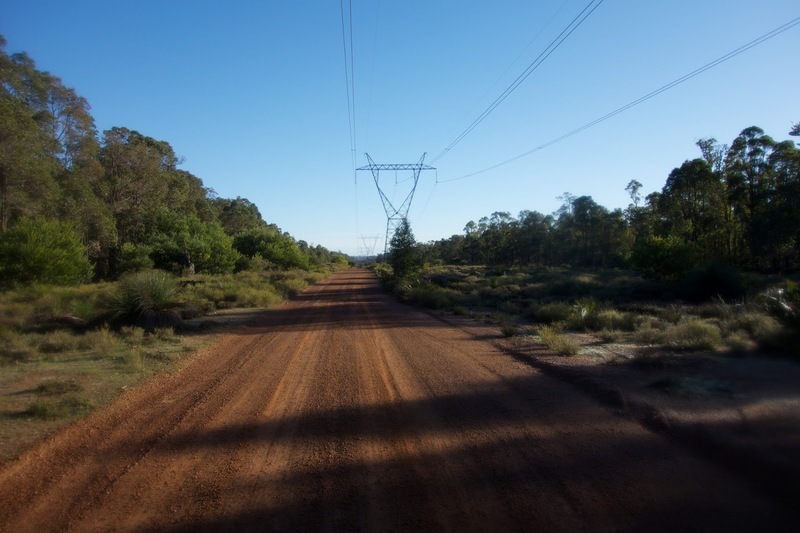 The section from Walpole to Northcliffe is known as the Walpole Wilderness and its pretty remote. And hilly. And remote. And hilly. Although the maps mark this as mostly intermediate country the climbs - although not long - were usually too steep to ride (well single speed that is). I hit the campsite at about 11:30 or so, just in time to get into my sleeping bag and listen to the rain start to pelt down. Whew! Sadly it was still bucketing down when my alarm went off at 5am the next morning. After giving myself an hour lie in I got dressed, put on my wet weather gear and headed out into it. At this point I realised that I had perhaps gone a little long the day before and just had nothing in my legs. This meant lots of walking. In the rain. Oh joy. The track in this section was actually pretty good - old overgrown logging roads with sections of singletrack cut in to connect various sections - upon reflection it was really quite beautiful. Of course, at the time I was wet and cold and has developed a little bit of a sniffle so perhaps did not appreciate it as much as I perhaps could have. Oh and of course another camping (and water) site along the way had been destroyed by fire (once again no mention in the notes!). My mood didn't improve much when I finally reached Northcliffe (after taking more than 6 hrs to go 80km) to find that the only cafe in town had closed about 10 mins before I got there (at 2:30 in the afternoon!). Sigh. I eventually sat down and had snack of some twiggy sticks and junk food washed down with some milk before heading off to ride the next section to Pemberton finally riding in at about 6pm. The highlight here was a series of tight switchbacks leading up into Pemberton - real tight singletrack riding where you got so into the trail that you didn't even realise just how much elevation you were gaining - magic stuff. I was pretty much toast so called it a day figuring that a hot meal and an early night would mean a better day. I woke up on Day 3 with a raging sore throat and a cold. Oh great. But still it was nice to get up and get dressed somewhere warm and at least (although it was cold) it wasn't raining! I had a great time on this section - the riding was quite tough with lots of climbing but for the most part I was able to ride it and there seemed to be a lot more singletrack cut in - or at least track sections on very old rail trails which had turned into singletrack over time. One particular segment has about 3km of downhill switchbacks. Truly a spectacular piece of trail. Whlist I'd left too early for breakfast in Pemberton, the towns along this section were quite well spaced and I managed to get a decent breakfast in Quinninup. 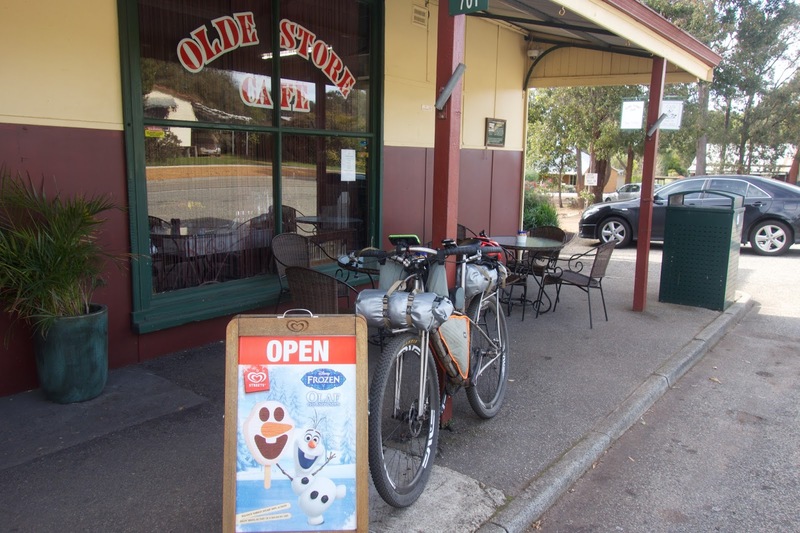 I managed to eat quickly and get on my way and eventually arrived in Manjimup (the 80km mark) still in time for second breakfast. Oh and more importantly, a source of cold and flu tablets as well as industrial strength throat lozenges! Yup. That cold was progressing nicely and I was developing a nice chesty rattly sound! The riding from Manjimup to Donnelly River (a 50's mining town now offering cabin style accommodation) was great - awesome singletrack and interesting scenery which just encouraged you to push on rather than get bored! Just as well as I don't think there was a flat section on the entire track! 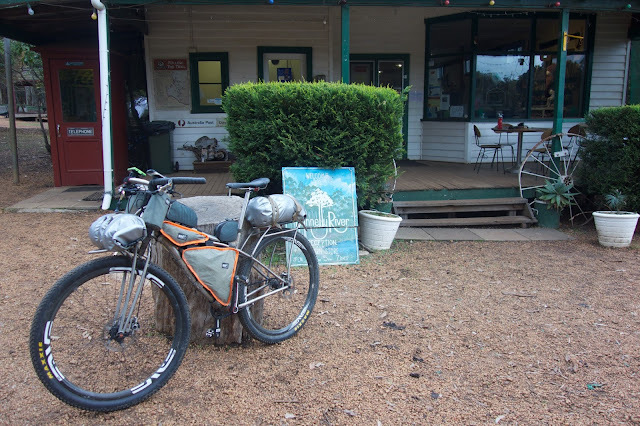 The little cafe at Donnelly River was (a) open and (b) looked inviting so I stopped and chatted to the owners while enjoying a nice vienna coffee. 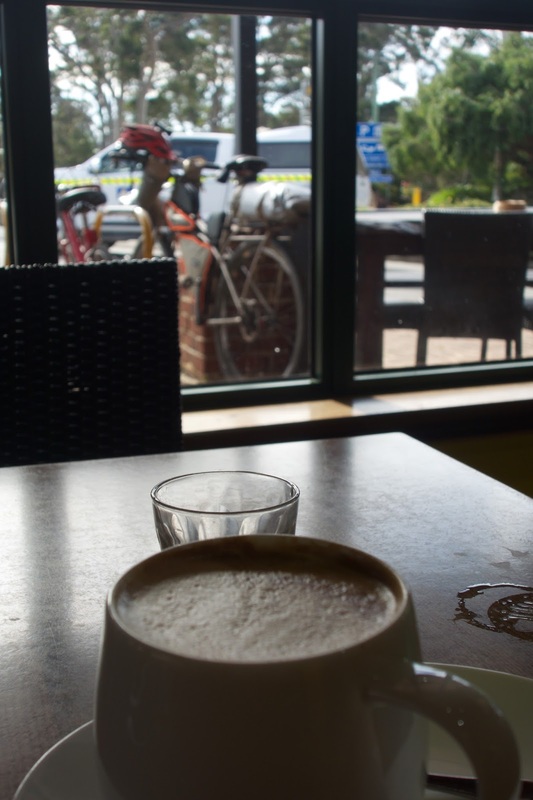 At least I thought it was nice - lets face it, when you've been riding for the better part of 10 hours and you find a nice warm cafe, anything it serves is nice by definition! 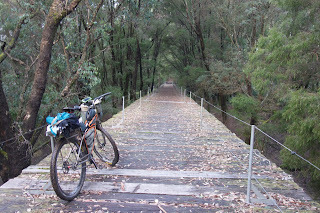 I was still feeling good so kept pushing on to Nannup. The nice singletrack soon gave way to more open gravel roads and then... shock... tar! It says something about the awesomeness of this trail that it was almost a relief (and certainly a novelty) to spend time on a smooth (ish - this is country Australia) road. What wasn't great was the hefty climb - I hate climbing on tar on the single speed - no excuses... if you stop its cause you ran out of legs! Once at the top though I was treated to a good 20 minute tar descent! Awesome stuff - yes dirt descending is great but sometimes its nice to just be going fast! Although by now it was dark and the wind chill was killer. It was a very cold rider that pulled into Nannup (what is with all the 'up' towns in Southern WA?). 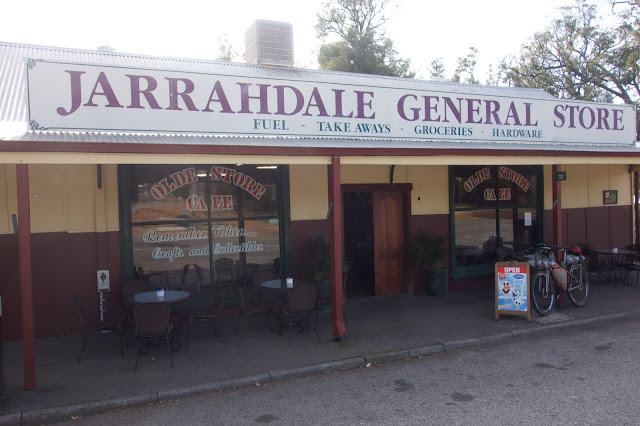 In small country town fashion not much was open but the pub did an awesome counter meal with a roaring open fire and it was nice to just sit for a while. After dinner (the menu said lamb shanks but it was the biggest bloody lamb I've ever seen!) I looked at my map and decided that I'd try and make the 80km or so to Donnybrook. I'd heard from a guy I met on the trail that the first 40km or so was all rail trail so I figured I'd make good time on that section and was looking good to make it by midnight or so. It was getting to the low single digits but I was carrying the gear for riding in those temperatures and besides, when the legs feel good... keep going! After some old school accommodation searching (my data plan had failed so I was using these yellow pages thingys!) I got a room in a motel and they agreed to leave a key in the lock. Knowing that I had a warm bed for the night was another reason why leaving the warmth of the fire to ride into the night seemed like a good idea. So the ride out of Nannup was rail trail as promised and very fast. After that though it was into some real bush bashing territory (think markers tied in trees every 20meters or so!) - it was actually pretty ridable but slow going and quite mentally fatiguing. I'm blaming that on the schoolboy error that followed. The whole trail is very well signposted - every point where you think you might need to make a decision there is a helpful trail marker pointing which way to go and usually another one in 50m or so confirming you're going in the right direction! Hence it was a bit of a shock to arrive at a track junction and have the direction markers point both ways! Hmmm. I had the route mapped on my Garmin (which was about 90% accurate due to the vagaries of the tracks the Mundi Biddi uses and Garmin's route finder) and didn't remember there being an option to split the track here so I trusted the Garmin and went left. Why. Didn't. I. Check. My. Paper. Maps! By the time I worked out that I should have been in the town it was past midnight. Reading the maps by torchlight I worked out that Donnybrook was actually a 5km out and back off the main track and I'd missed it entirely. Bugger. More map consultation revealed that there was a cycle camp ground about 25km away so I decided rather than backtracking the 20km or so to town I'd just keep going. Of course this was the beginning of the hilliest section of the whole trail. I eventually came across a caravan park at about 3am (that actually seemed to have a pretty good cafe and shop - can't comment as it was of course closed during my visit) and was pretty much toast. I found a disabled toilet that was open and dragged my bike and gear inside and went to sleep. Too tired to even get out of my riding gear. Note to self. You are never to tired to do this again! I got up at 5:30 or so after a bad 2hr nap - I wanted to be away before people were starting to stir and potentially query as to why a smelly man was sleeping in a toilet! At this point the effort of the day before really hit me. I just had nothing in my legs. To top it off, the initial section through the Collie River valley is brutal - the hardest climbing sections of the track... both up and down! Or at least it would have been if I hadn't ended up walking most of it! My cold had turned into something nasty and I was coughing up more green slime than an episode of 'You Can't Do That on Television'. I really was not having a good time and thoughts of pulling out began to creep in. Collie, while part of the Mundai Biddi trail is actually about a 40km out and back detour so in my initial planning I was actually planning to skip it as I was confident that I probably wouldn't need the resupply but given how broken I felt the trusty sheep and I trudged into Collie (yes you can trudge on a bicycle). I sat down at the first cafe I found (after about 4 hours or so of travelling) and began the process of refuelling and taking stock. I felt a lot better once I got food but was starting to feel quite ill (as well as simply blocked up) and was dubious about my ability to make the next major town by the time things closed and didn't feel up to sleeping rough. It turned out the cafe was actually part of a small refurbished hotel (pub style) and after catching me falling asleep in my second bucket of coffee, the owner asked if I'd like a room. Although it was just after 11:30... it took me all of about 2 seconds to agree! I figured I'd sleep for a few hours and if I felt good when I woke up then I'd just leave otherwise make an early start the next morning. Well, waking up at 6pm I still didn't feel better so decided that a night in Collie it was and ventured out in search of food. I found I was actually craving asian food as I'd been pretty much living on breakfast fare and some sort of meat and 3 veg country standard stuff (all of which was delicious nut same-ish). So I tested out the Collie Chinese Restaurant. Well, lets say it was a case of quantity over quality... I suspect living in Singapore might have spoiled me for aussie chinese! I was back in bed and asleep by 8. Alarm set for 4:30 to get an early start and perhaps get back some of the time I'd lost by sitting around all day. Day 5 dawns... (well actually it was a while before dawn but I digress) and if anything I'm feeling worse. Head feels like its going to explode, great gobs of green gunk are ejected with every cough and I feel like I've just done 10 laps of Manly Dam on a 'cross bike. 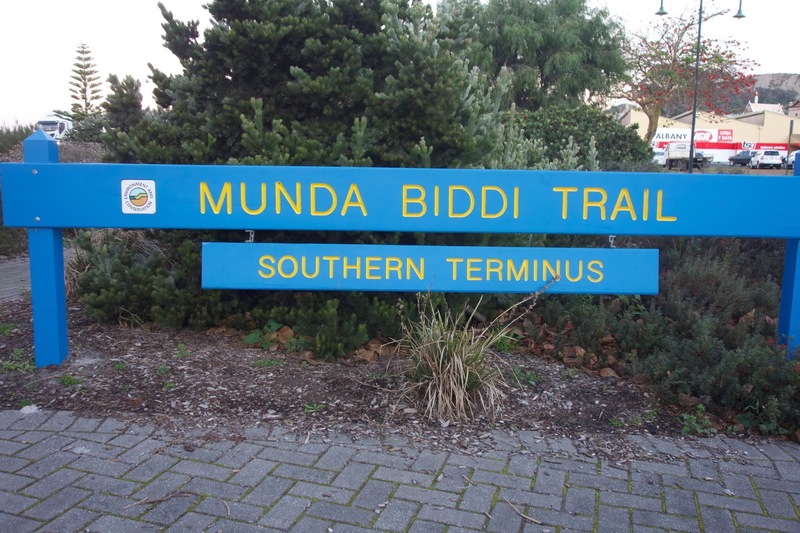 Reluctantly the decision is made that my Munda Biddi adventure is over. After lying in bed for a while feeling sorry for myself my attention then turns to the new logistic challenge of just how to extract myself from Collie... its not that it isn't a pleasant enough place it's more that I've now spent the better part of 18 hours in a room thats slightly larger than a double bed and I need to get out. Besides I have a sneaking suspicion that whilst the train station looks very shiny the trains might be somewhat infrequent! Well, turns out my train prediction was more or less spot on... infrequent to the point where they don't actually run anymore! Its actually used as a bus station. Only in Australia... Ok. Bus it is then. So, I got up. I got dressed. But the funny thing was that once I got dressed I began to think... 'well its 60km to Bunbury... I may as well just keep riding the route'. Before I knew it, I was in Mc Donalds fuelling up on brekky mc muffins and heading back out on the trail! I actually rate this day as one of the most fun times I had on the trail. I stopped and took a couple of photos, had an awesome second brekky at some caravan park in the middle of nowhere, dodged some enormous mining trucks (when I decided to ignore the signposted detour and followed the original route despite the 'route closed' signs) and eventually ended up in Dwellingup at about 6pm. I actually felt like I could go on but common sense prevailed and I decided that having dinner and staying and in the pub (and enjoying 2 dinners!) was a much better plan. After the relatively easy day before and an early night to bed, I woke up feeling quire refreshed. Of course no-where was open for breakfast but I had planned ahead and mixed some peanut butter with boiling water and milk to create a delicious drink. Yes it sounds gross (ok - I just dry retched thinking about it) but at the time it was pretty good and besides - its not normal peanut butter its gourmet! I headed off into the dark to tackle what would be my final day. Initially I had set myself a target of sub six days and although I had secretly hoped to go under 5 I was still on track to make my initial time so I was feeling pretty good. To top it all off I was able to take a deep breath without my chest rattling for the first time in 4 days so I was on top of the world! One of the things I'd been advised was that the best bike for the Munda Biddi was a fatbike... so far I hadn't seen why people would say that... today I managed to find the 50 meters or so of track that a fatbike would have worked better. So 50m in approx 1100km - yeah its a fatbike trail... NOT! I pulled into Jarrahdale and found a great little cafe and had a nice brekky. Actually it was so nice I had another brekky (it was quite funny - the ladies that ran the place were actually quite offended that I ordered a second and made it about double the size of the first one - mustn't get many hungry through riders!). From here it was only about 100km to go and I was feeling great. Now its been my experience that sometimes the end of long bikepacking trips are somewhat anti-climatic - you know you see and experience amazing things on the trail and then at the end you just potter into whatever finishing point is randomly selected (hello Tour Divide!). Well. This is not the Munda Biddi experience. I would rate the last 100km as roughly the equivalent of most 100km MTB marathons in Oz (but with more singletrack!) Technical, hilly and some intense navigation and even the requirement to walk descents which hadn't happened anywhere else on the trail. Lawd knows how you'd get a bob trailer through there! It was a tired rider that pulled into Mundaring (despite the nice sign in Albany - finding the corresponding sign was almost impossible) - singletrack until the last 10 meters or so and an amazing experience. My total ride time was about 5 days 12 hours or so which I'd rate as acceptable. I don't know anyone else who's tried to through-ride TDR-style so I guess this stands as the quickest time so far. As far as routes go, I rate this as the best backpacking trail I've ridden (yes more so than Tour Divide). Whilst it is relatively short, 80% or it is off-road and by off-road I mean true MTB territory rather than a mix of back roads and gravel. I suspect I would be quicker over the route riding my Moots Routt 45 but it would be a lot harder for sure. I guess the true test of a great ride is that when you hit the end how do you feel? After TDR I remember quite clearly thinking 'never again' (although I'm reconsidering!) but after Munda Biddi the thoughts in the taxi on the way to collect my stuff from the start were more about when could I schedule to do this again. The track's a winner and in my NSHO every aussie bike-packer owes it to themselves to ride it at least once. Actually, the challenge would be to only ride it once - I plan to be back! Cool write up. Sounds like a fun ride but at a slower rate than you did it. Also, the 'up' suffix means 'place of' in the local aboriginal language. What an awesome ride! 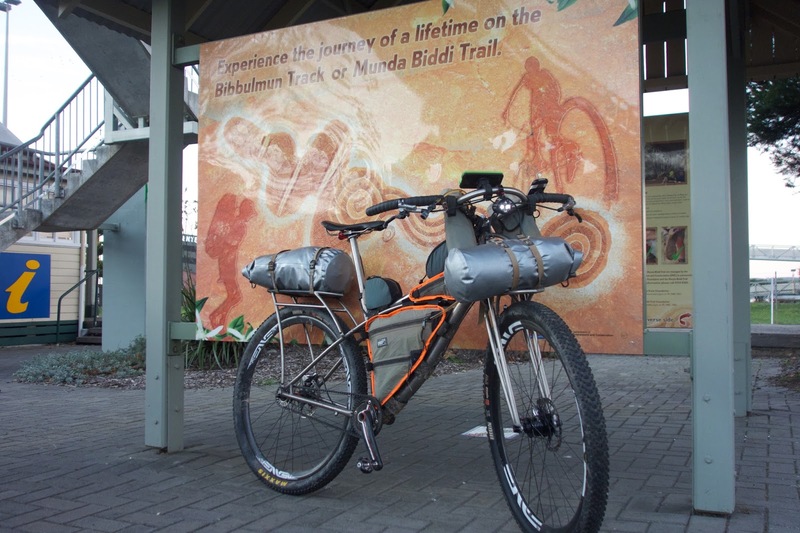 Can I post a link on my Munda Biddi Website (www.followmyride.com.au )? I would like to also post it on Facebook too if that is OK (followmyride1). I really enjoyed reading about your ride and it was really interesting to read the point of view from an international traveler. You have GRIT! Great read. as Stu advised, 'up' suffice means 'place of'. i.e. Manjimup is place of the Manjim reed. Winter is a very different story to summer and the pea gravel may warrant a fat bike in summer. Traveling with a trailer is always be an adventure. I personally love to travel to an unknown place with my motorbike trailers. Thanks for sharing!